If you haven’t yet got your Valentine’s Day presents sorted, then we have some terrifying news for you – it’s two weeks tomorrow!! For many, Valentine’s Day is full of gift-related pressure, with the looming threat of a bad gift turning the romantic atmosphere sour. Here at Red Candy we understand this pressure, so we’ve delved into our catalogue and handpicked some products that we’d personally love to receive from our OHs on the Day of Love itself! We have included some lovely heart-themed products for all you hopeless romantics out there – however we are well aware that hearts and flowers aren’t everyone’s cup of tea, so we’ve also thrown in two alternative gift guides for her and him! You. Are. Welcome.! Check out our full selection of Valentine’s Gifts here. 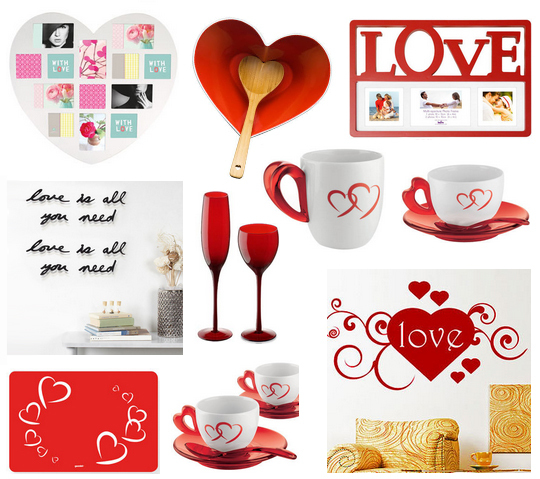 Hearts, love, red products, and the like! Whether it’s a set of romantic tea lights to set the mood, a funky photo frame filled with your favourite moments together (obviously you supply the photos…), or a stylish jewellery tree – we are bursting full of fab gift ideas for her! Why not give your hubby/boyf/OH a funky gift for their man cave – such as a retro style clock or Banksy wall sticker? And if they love the *odd* tipple then a designer set of whiskey glasses is the perfect gift. Check out our full selection of Valentine’s Day Gifts here.